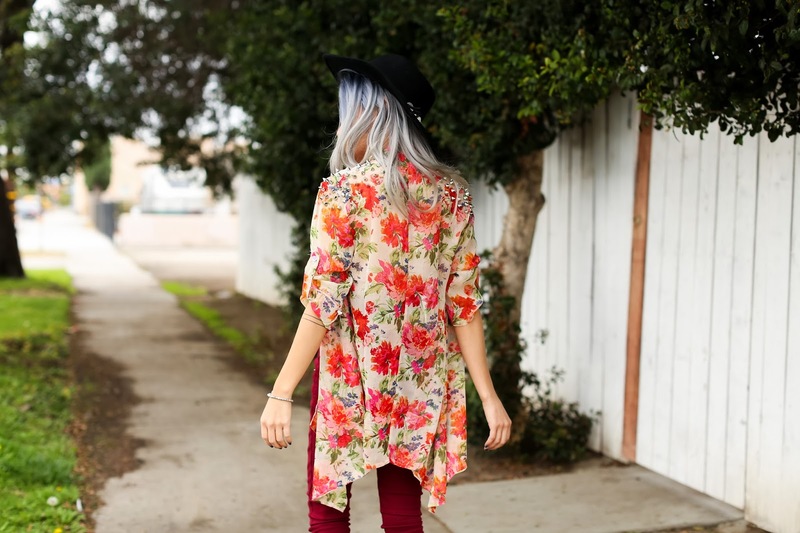 Sweet Rebel kimono (c/o). Lex & Mila top (c/o). Forever 21 pants and shoes. Sweet Rebel is a shop based in Florida that perfectly embodies the easy, breezy coast lifestyle, be it Florida, Los Angeles, Australia, etc. One of their offerings is this beautiful floral kimono. It's semi-sheer and has a hi-low hem, silver spikes along the shoulders and back, and button closures to give you the option of wearing your sleeves up or down. I color-coordinated it with some burgundy skinnies and oxblood/black colorblock platforms! This post was sponsored by Sweet Rebel. Check them out here. This would be so perfect right now for spring where I am!